Manila, 4th August, 2011 – During World Breastfeeding Week, UNICEF joins global partners in calling for the benefits of breastfeeding to be broadcast beyond clinics and delivery rooms to the public at large, ensuring that young people both in the developing world and in wealthier countries understand the importance of breastfeeding long before they become parents. Breastfeeding is directly linked to reducing the death toll of children under five, yet only 36 per cent of infants under six months old in developing countries are exclusively breastfed. In the Philippines, only 34% of mothers exclusively breastfeed their babies for 6 months, and the number drops to 2% at one year. One of the factors is the lack of a strong enabling environment that supports breastfeeding mothers. The powerful benefits of breastfeeding for child survival, growth and development are well known. Scientific evidence has shown that breastfeeding could lead to a 13 per cent reduction in deaths of children under five if infants were exclusively breastfed for 6 months and continued to be breastfed up to two years. Breastfeeding also plays an important role in preventing stunting (low height for age), a condition that can cause irreversible physical and cognitive damage, and which is viewed as a key indicator reflecting inequities in society. Given its critical importance, UNICEF firmly supports all efforts to accelerate comprehensive action to improve breastfeeding rates globally, in every country and with a particular focus on reaching the most disadvantaged and hard to reach populations. “Breastfed is best fed, whether the baby is born in Uganda or England, the Philippines or Canada,” said Lake. Women generally have received information about the importance of exclusive breastfeeding when they go for antenatal care visits, or after they deliver their babies. That is why community health networks should have staff that not only possess updated knowledge and skills to support mothers to start breastfeeding, but also offer guidance and clarification on how to sustain exclusive breastfeeding for the first six months and to continue to breastfeed until two years and beyond. Yet, while breastfeeding rates in the developing world are on the rise in two-thirds of countries with data, millions of infants are not benefiting from this life-saving practice. In the Philippines, UNICEF is working with the government, the private sector, NGOs, breastfeeding advocates and mothers to create an enabling environment for mothers to breastfeed. Through continuous advocacy, helping peer support networks, reaching out to mothers in communities and workplaces, supporting human milk banks and enforcement of the Milk Code, UNICEF helps promote a breastfeeding culture in the country. ‘It’s clear we need to take breastfeeding awareness to every corner of the country, from cities to rural communities. 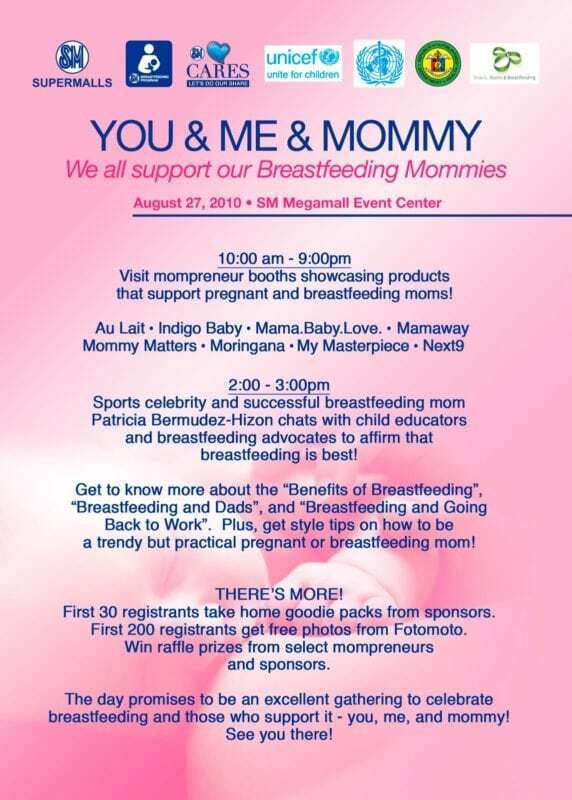 Not just mothers, but fathers, in-laws, teachers and business leaders all have a role to play in supporting a breastfeeding culture in the Philippines. In doing so, they are giving infants and young children the best possible chances of a healthy, secure start in life’, said Vanessa Tobin, UNICEF Philippines country representative. UNICEF embraces the idea of using all possible means of communication and encourages others to do the same, using the opportunity of World Breastfeeding Week to trigger action the whole year round. UNICEF Philippines will have a month-long celebration with the Department of Health, the World Health Organization, other government agencies, corporate partners, NGOs and mothers to spread the word about the benefits of exclusive breastfeeding for six months and continued breastfeeding for 2 years and beyond. This year’s celebration emphasizes the role that every member of society, especially fathers, can play to raise awareness about breastfeeding – a natural and nurturing start to life for infants and mothers. It also emphasizes that communication on breastfeeding should take advantage of non-traditional and newer communication tools such as social networking, blogs, mobile phone technology, the arts and flash mobs. August is breastfeeding month.And if you must know, I support breastfeeding and I advocate it. There is so much benefits breastfeeding can give. Imagine being able to feed your baby even if you’re only on your lingerie. If you are on bottle feeding, you need to wear your robe, your shirt before even standing up to prepare a formula for the baby. That’s actually the most convenient benefit of breastfeeding. No need to get up in the middle of the night to feed the baby. All you have to do is open your shirt or clothes and the baby will know where it is. Of course in terms of health, breastfeeding has a lot of benefits. I can attest to that as all my kids are breastfed. I breastfed them exclusively for a year. And during that time and until now, they seldom got sick (except when they were infected with Primary Complex). And though they are always on the slimmer side, they are healthy and they are very active kids. Then there’s the financial benefits of it. Imagine not buying baby formula for a whole year? You can save a lot! And also, when you breastfeed a baby, they seldom wet their diapers, so that’s another one. You won’t have to change their diapers often. Emotionally, in my own opinion and in my experience, I feel bliss whenever I breastfeed my baby. There is so much contentment on it. Imagine being able to give life and being able to nourish that life, that is just too much. I am talking here on the emotional benefit on me. Breastfeeding is not easy. I have been there and it was really hard. You need to be focused on your goal. You need to exert effort. You need to know that if you choose to breastfeed you have to work hard. Not all woman are lucky enough to express milk right after their baby’s are delivered. Like me, I worked two weeks before any milk comes out of my breast. It was painful but I am determined to breastfeed my baby. All my efforts were all worth it. I don’t criticize moms who did not breastfeed their baby but to me, it’s the most natural thing to do, so why not feed your baby. I hope in the future, I will be able to help new moms on how to breastfeed and how not to give up on it.